History is filled with stories that enthralled newspaper readers for weeks or months at a time, that were the currency of thought and speech for everyone and then suddenly vanished. Excavating these episodes—excavating the right episode—can bring to life a period, creating a microcosm for exploring attitudes and ideas of times long gone. In “The Murder of the Century,” Paul Collins focuses our attention on a New York murder that created a sensation in the summer of 1897. One afternoon a group of boys playing by the East 11th Street Pier found a flashy red-and-gold parcel in the water. They excitedly unwrapped it, but instead of finding something to eat or sell, they discovered a man’s torso. The next day another part of the body was found in an isolated rural area of the Bronx, near 170th Street along the Harlem River. The inept, corrupt Manhattan police of the time wanted to write the discovery off as a medical-student prank. But the newspapers had put themselves on the trail, in particular Joseph Pulitzer’s New York World and William Randolph Hearst’s New York Journal. Pulitzer, whose populist crusading had once put him in the vanguard of journalistic innovation, was fast being overtaken by the rich and rambunctious Hearst, their struggle propelling the era of yellow journalism ever faster toward sensationalism. Pulitzer’s paper offered a staggering $500 reward to any reader “who could deduce a solution”; Hearst then offered $1,000. Hearst had been topping Pulitzer for some time, spending more money and willing to field more resources. Now he was beating him with technology, too, as the Journal reproduced a facsimile of the oilcloth—the first time color had been used in a news story. Meanwhile, a journalist at the World had a hunch, based on his viewing of the torso at the morgue. The combination of strong muscles and soft, well-cared for hands sent him heading for the Murray Street Baths, where, sure enough, a masseur named William Guldensuppe had failed to show up for work. Despite this brilliant leap of intuition, Pulitzer was pipped to the post when one of Hearst’s reporters located the man who had sold the oilcloth. This breakthrough, in turn, took the reporter to the apartment of the buyer, one Augusta Nack, landlady and lover to Guldensuppe, and a local midwife. As Mr. Collins notes, she had a brass plate claiming that she was “licensed,” even though no licenses were necessary, or available, to midwives. She was, it emerged, a back-street abortionist. 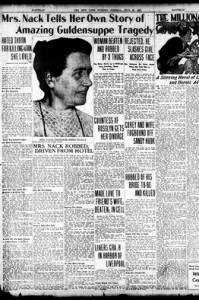 Once at police headquarters on Mulberry Street, Mrs. Nack was giving nothing away, despite a quickly unraveling story. It turned out she had been involved in a love triangle with Guldensuppe and his fellow-lodger, Martin Thorn, whom Guldensuppe had recently treated to a beating. Everything now seemed set for a quick, if thrilling, trial, with only one possible result. Indeed, neither the perpetrators nor the result are in doubt from the early pages of “The Murder of the Century.” It is therefore greatly to Mr. Collins’s credit that he keeps the narrative interesting, moving from investigation, to trial, to sentencing and after. The pace is admirable—he ensures that the reader is up to speed on details of current court procedure, or the politics of fin-de-siècle New York, yet he never becomes bogged down in unnecessary side-issues. His exploration of the newspaper world, at the very moment when tabloid values were being born, is revealing but also enormously entertaining. Given the many strengths of “The Murder of the Century,” it might seem unkind to belabor these points. But it is because of the strengths that weaknesses are worth mentioning. Mr. Collins has a clear eye, a good sense of telling detail, and a fine narrative ability. If only he, and possibly his editor, had spent more time on the nuts and bolts of creating a book, “The Murder of the Century” would have been of more than ephemeral value. This entry was posted in Journalism and tagged 19th century, Journalism, Newspapers, Wall Street Journal by inspectorbucket. Bookmark the permalink.